In common with other practices across Wales, this service is now active for patients, and offers functionality including repeat prescription requests, updating personal details, as well as (in future) booking appointments online. 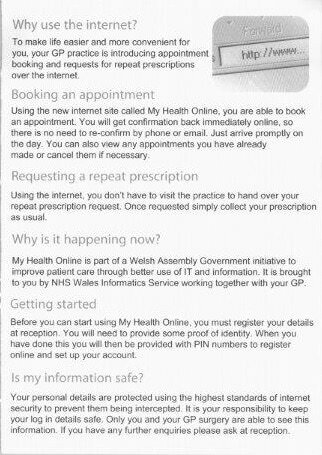 The service is maintained via the Welsh NHS IT services, and is beyond our control, apart from the initial registration. Initially, we will only be offering this facility to our Pontypridd patients, but hopefully in the coming weeks, we shall extend and offer the service to Tonteg Surgery patients also. If you are interested in using this service, please contact Eglwysbach and ask for Demi or Niko, who will talk you through what you need to do. Essentially there is a form required (downloadable here so you can print and fill in before attending), and we also need to see official photo ID (passport/driving license etc) in order to validate your application for purposes of information security and confidentiality. - MyHealthOnline permits users to 'tick' their current repeat medication, but will not allow requests of acute/'one-off' items. - If a medication has run out of issues (as a medication review is needed) then the medicine will not be visible online, in this case - please contact the surgery to flag this up, as unfortunately this is beyond our control at the present time. - If login credentials/passwords etc are lost, it can take time to restore these and this requires a trip to the surgery. ​- The MyHealthOnline service is a more secure option for transmitting your personal information on the internet.